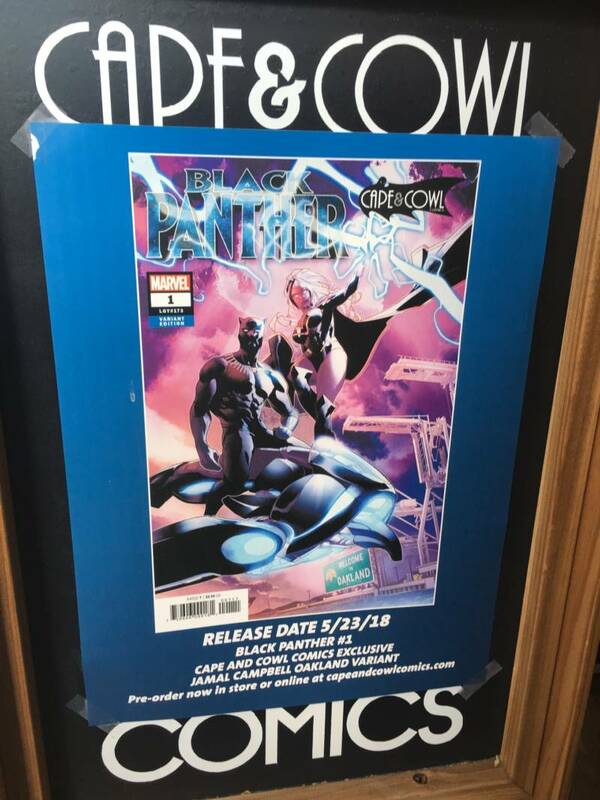 Starting this week, Oakland comic book store Cape & Cowl will be the only place in the world you can buy an exclusive edition of Marvel’s newest "Black Panther" comic book. What's so special about it? It has an Oakland-themed variant cover, designed by artist Jamal Campbell. Fans of the blockbuster "Black Panther" movie know it starts -- and ends –- with scenes in Oakland. The city is also the hometown of director Ryan Coogler. So when Marvel offered stores the chance to commission special covers for certain comic books, Cape & Cowl jumped at the chance. The shop ordered 3,000 copies of Marvel's new "Black Panther #1" with the Oakland-themed variant cover. “Along the right-hand side, we’ve got the cranes from the Port of Oakland," says Cape & Cowl owner Eitan Manhoff, describing the special cover. "Down at the bottom, we’ve got the ‘Welcome to Oakland’ sign. Front and center is Black Panther on this futuristic Wakandan ski-do thing, and right there with him is Storm from the 'X-Men.' "
The comic book is the latest issue of the series by author Ta-Nehisi Coates and artist Daniel Acuña. Manhoff says he was nervous at first about selling all 3,000 comic books since the store has never sold even close to 1,000 copies of a single issue. But he says the store has received a large and enthusiastic response from the community. "I get Twitter messages, Facebook messages," Manhoff said. "My phone is just constantly buzzing right now." Manhoff says there have been 1,500 pre-orders as of Sunday, including orders by phone, in person and online, with most orders coming from locals. 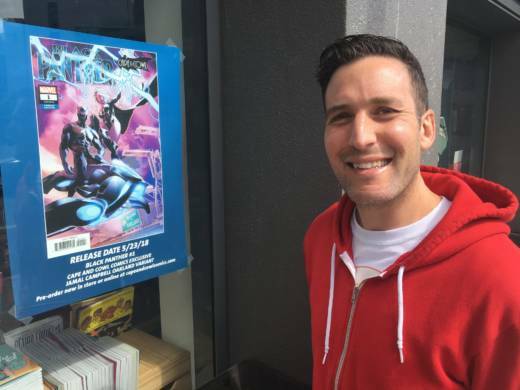 Oakland resident Johnny Morales ordered three copies of the comic book, including one for his 13-year-old daughter. “Seeing the city of Oakland represented on this magnitude is just awesome, and it’s inspiring and it’s important for me,” Morales said. Fellow Oaklander Brian Jaton was also excited about the local tie-in. “After seeing the movie, and with the Black Panther Party itself starting in Oakland, it’s especially cool that there’s a special copy for the Cape & Cowl," said Jaton, who pre-ordered copies for himself and a friend in San Diego. Manhoff has been pleased by the overwhelmingly positive response. “We just wanted to keep the excitement from the movie and the town pride from the Black Panther movie going,” he said. The comic book will sell for $4.99 and hits the shelf on Wednesday.